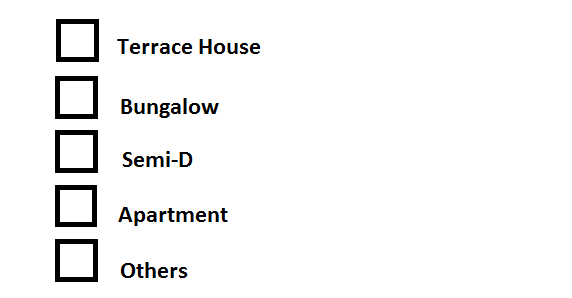 One time in primary school, we had this survey where we had to answer things about our house. One of it was house type. Then that time I was young and didn't understand these words yet so I asked my teacher what's a Bungalow and she said it's a big house with garden. So you know.. Being a small girl, my house is big la right? So I went and tick Bungalow then mana tau when I went home to ask my mum she said we are staying in a terrace house. A bungalow is MUCH BIGGER. Then I started getting scared cos now I accidentally lied in the survey. What if my teacher finds out that I don't actually stay in a bungalow?! Will the government come and find me?! Then all my friends and classmates will think that I purposely lied about my house oh no oh no oh noooo! Stressful moment, I tell you.. Didn't know even a kid can be so stressed about houses. But it's not over.. Now when we get older, house stress comes back when you wanna buy a house =( House, why you so scary?! Now there are even MORE types than when I answered that survey. And they all come with different prices. Honestly, I know nuts about buying houses and it scares me. I don't want to end up buying a wrong one and having to pay for it the rest of my life. Luckily, there are websites like Propwall to help me! 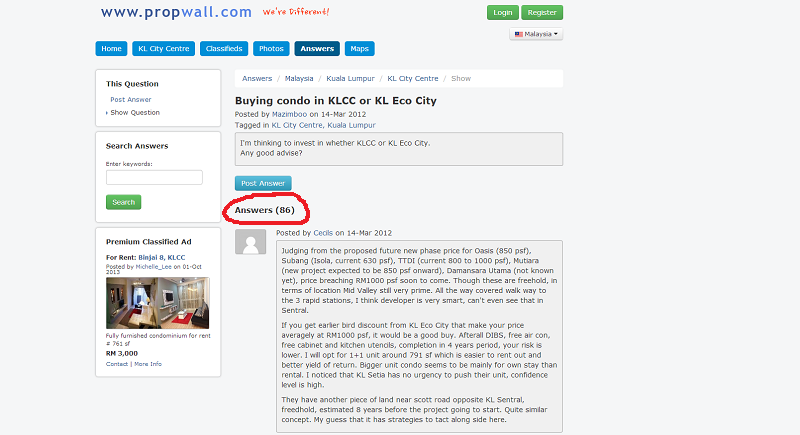 It contains a lot of KL local infos to guide me through the process, like average prices. They also show the Hot Spots and Top Properties in the area. Great if you don't know where to start. Just click on random spots and start researching. Inside you will find a summary of the area, property details, layout, facilities (for condo), market trends and even an analysis. I feel like this website is talking to me. But you guys are really helpful! 86 replies?!?! I'm impressed.. Okay.. Since both my older siblings bought house already, my dad turned to me and said 'you are next'. It's okay, I have Propwall to help me! Kekeke.. There are plenty of choices around what is and what is right for you, please select it. Very useful and supportive article. I wish I can do all of that in a short period of time.